Pete Levin Films: "Just Shut Up!" A Saturday Morning Fun-Time Romp! "Just Shut Up!" A Saturday Morning Fun-Time Romp! 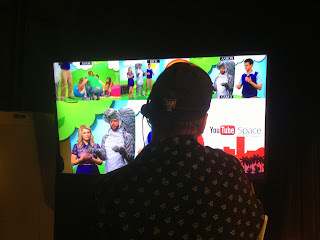 The concept for the show is simple; Andy runs a local Saturday morning kids show in the vein of Bozo the Clown or Captain Kangaroo (or my childhood favorite, Captain Chesapeake). 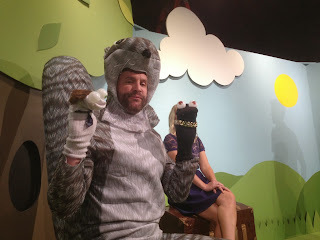 With him are his co-hosts, Miss Wendy and Mr. Squirrel. Poor judgement and not-so-kid-friendly hijinks ensue. The dry wit of head writers Steve Murphy and Peter Meadows along with the natural reactions from the "kiddos" made for a really fun show. The show also features clips of cartoons from Smosh's successful Shut Up! Cartoons lineup. Three-camera studio shoots present challenges that are very different from those in single-camera shoots and it was a great opportunity to explore this way of putting a show together. I feel lucky to have gotten a chance to work with a cast and crew who had such a strong enthusiasm to work together and commitment to get these made. 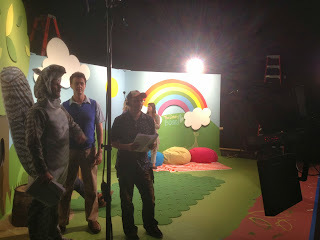 Did I mention we shot all 20 episodes over the course of 3 days?